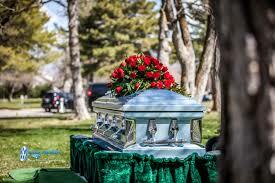 A Graveside Service is conducted at the gravesite either with casketed remains or cremated urn cremains. The setup at graveside is a family preference and can consist of photo collages, selected music or a display table with personal items. The clergy or family will conduct the service at the cemetery graveside and the deceased remains will be laid to rest.